Each week, I'll be doing an in-depth scouting report on the Patriots opponent, going over their tendencies, strengths and weaknesses in all three phases of the game. 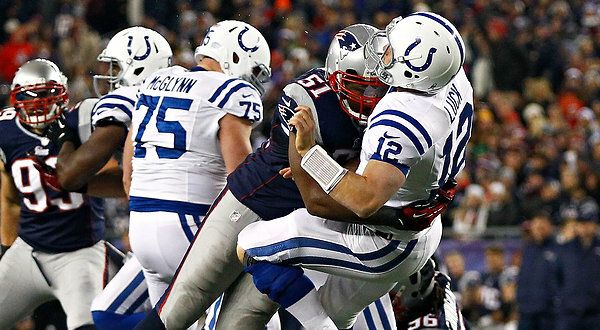 This week needs no introduction: it's the first time the Patriots have faced the Colts since their complaints to the league office set off the league's deflategate witch-hunt. The Patriots have dominated the Colts throughout Andrew Luck's career, and will look to further embarrass them in their building this week in the biggest revenge game of the revenge-motivated season. On to the matchups. On paper, this should be the strength of the team. Buoyed by Luck and and a deep, talented group of pass catchers, they were amongst the league's best offenses last year. On paper, they appeared to improve this season, adding veteran stars Andre Johnson and Frank Gore and drafting Miami receiver Philip Dorsett in the first round. Instead, the offense has flopped this year. They currently rank 24th in the league in scoring (averaging a mere 19.8 points per game) and 23rd in yards gained (1,674). Last year they ranked sixth and third in those two categories. What gives? 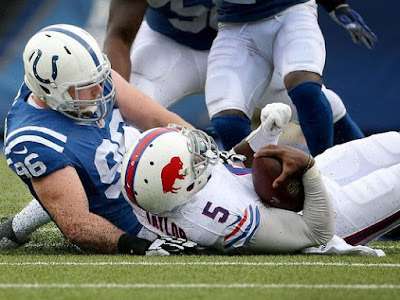 Turnovers have been arguably the biggest factor in the Colts early season struggles. They rank 31st in the league in both giveaways (12) and turnover differential (-7), with only the hapless Lions and Texans saving them from the cellar in both categories. Much of the blame for that lies squarely on injured shoulders of Andrew Luck, who threw a whopping seven interceptions and committed 2 fumbles in his three starts before getting shutdown the past two weeks due to a mysterious shoulder injury. Some of the blame for those numbers can be deflected towards a porous offensive line, but it's worth noting that backup QB Matt Hasselbeck threw no interceptions and only committed one fumble in his two starts in Luck's stead. If Luck goes on Sunday (all signs are pointing to his return), he'll simply have to take better care of the football, as turnovers have plagued him throughout his career against the Patriots. He's only thrown more touchdowns than interceptions once in four games against the Patriots, with overall totals of 6 touchdowns against 10 picks. The Colts like to take advantage of Luck's powerful arm by emphasizing the downfield passing game. When all is working well, it's an effective strategy, especially given their deep arsenal of receivers who can make plays down the field. However, those seven step drops require the offensive line to hold up in protection longer. That's been an issue throughout Luck's career, and his line has continued to struggle this year. Left tackle and BC alum Anthony Castonzo has developed into a solid blindside protector, but he's been the one constant in a line that's already been reshuffled several times this season. The biggest issue has been at guard, where veteran free agent signing Todd Herremans and journeyman Lance Louis were benched after two ineffective starts. That led to promotions for 2013 third rounder Hugh Thornton and veteran journeyman Joe Rietz, although Rietz was moved after one game to right tackle when 2014 second rounder Jack Mewhort was moved from right tackle to left guard. Placing Mewhort next to Castonzo has solidified the left side of the line (Mewhort has the eighth highest grade amongst qualifying guards from ProFootballFocus), but Thornton, Rietz and starting center Khaled Holmes are all below average starters who could get exposed easily by the Patriots talented cast of pass rushers. Look for Matt Patricia to move his front seven chess pieces around to create advantageous individual matchups, particularly for the likes of Jabaal Sheard, Chandler Jones and a blitzing Jamie Collins. Dominique Easley could also have a breakthrough game against Thornton, who is far better at run blocking than pass protection. The importance of getting pressure home and affecting Luck's rhthym in the pocket can't be overstated, as he still has a very talented cast of receivers to throw to when he gets time. His number one target remains TY Hilton, an explosive deep threat who plays primarily out of the slot. 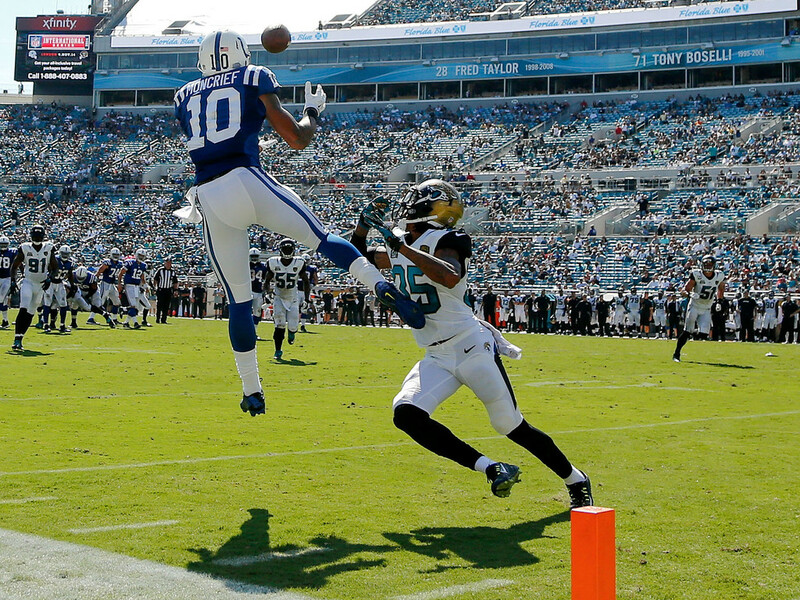 Hilton easily leads the team in targets (50), catches (27) and yards (382), and his 14.1 yards per catch is easily the highest of any Colt with more than 20 targets in the passing game. Unfortunately for the Colts, Hilton was a surprise addition to the injury report yesterday with a groin injury, leaving his status for Sunday night up in the air. If he goes, he'll be a focal point of the Colts offense. In the past, the Pats have handled him by putting slot corner Kyle Arrington on him with bracket coverage from a safety over the top. With Arrington gone to Baltimore, he becomes a likely assignment for Malcolm Butler, whose reactive athleticism makes him the Pats best option against Hilton's explosiveness. If he can't go, it wouldn't be surprising to see his role assumed by the similarly skilled Philip Dorsett. 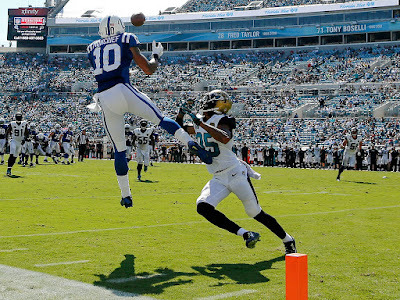 A first round pick last spring, Dorsett has enough deep speed to match any receiver in the league, but he's struggled to gain a role so far amongst Indy's crowded receiver depth chart. Committing 2 fumbles in his 9 touches hasn't helped his case, and that shaky ball security should be tested when/if he is on the field. Future Hall of Fame candidate and offseason signing Andre Johnson was supposed to step seamlessly into the #2 receiver role this year, but so far that job has gone to talented second year man Donte Moncrief. Last years third round pick, Moncrief flashed his explosive combination of size (6'2", 221) and speed (4.40 40 time) at times as a rookie, and so far trails only Hilton in targets (38), catches (24) and yards (278). His size has especially paid dividends in the red zone, where he already has a team leading 3 touchdowns. That size could be problematic for the Pats thin secondary, who could be playing with fire if they trust Logan Ryan, Justin Coleman or Tarell Brown to check him one-on-one on the outside. Size on the outside will be an even bigger problem for the Pats if the aforementioned Johnson can build off of last week's positive momentum. A nightmarish start for the season had led to rumors that the 34 year old Johnson was finished, but he exploded last week with a six catch, 77 yard, 2 touchdown performance against his former team. He doesn't quite have the deep speed he used to, but Johnson is still a massive (6'3", 219) target who excels at going up and getting the ball over smaller defenders. Whether he faces Brown, Ryan, or Coleman, Johnson could have some advantageous matchups to test. As if that size on the outside wasn't enough, the Colts also boast an impressive collection of tight ends to attack a defense with. Despite lacking the consistency to justify his status as a high second round pick, Coby Fleener remains an athletic mismatch in the passing game who has hurt the Patriots at times in the past. The Pats will also have to keep an eye on Dwyane Allen, a big, physical blocker and possession receiver who excels as one of Luck's go-to guys in the red zone. With Jack Doyle also around as a capable third tight end, this group should be a test for the Patriots safeties, who are coming off of an impressive performance limiting the Cowboys Jason Witten. Indy's passing game could also get a boost from this week's signing of running back Ahmad Bradshaw. Normally it would be foolish to expect immediate contributions from a mid-week signing, but Bradshaw has familiarity with Pep Hamilton's offense from last year, when he was a productive third down back before his season ended prematurely with a broken leg. We have yet to see how Bradshaw looks since that injury, but last year he still had plenty of explosive bounce in his step. If active, he'll assume some work on passing downs, where he's reliable in pass protection, has good hands, and is dangerous in the open field. Having a checkdown option like that could have done wonders for Luck earlier in the season. While Bradshaw was signed to fill passing down duties, the running game remains squarely on the shoulders of Frank Gore. Another high profile offseason addition, Gore struggled to find running room early on behind the Colts porous line, and earned ridicule for an unforced fumble on the goal line against the Jets. However, Gore has steadily improved as the Colts outside zone rushing schemes have found their rhthym, and he's averaged a solid 4.3 yards per carry over the past three weeks. Getting Gore going could be key for the Colts, as steady gains on early downs could keep them out of the problematic third-and-long type scenarios that can lead to turnovers. It would also help them win the time of possession battle, minimizing the amount of time Tom Brady's prolific offense can spend on the field. The past two games have proven the Pats can stop the run when it's a priority of their game plan. However, they have yet to show they can stop the run out of the nickel, which they figure to spend most of the game in against a pass heavy Colts attack. The Colts best plan of attack could be spreading the Pats out, which would ensure lighter boxes for Gore to run at while creating advantageous matchups against the Pats thin secondary in the process. As long as they can keep the score competitive, expect Gore to be heavily involved in the game plan. Luck's turnover problem hasn't helped, but the Colts defense has been the primary culprit for the franchise's recent sequence of humiliating defeats at the hands of the Patriots. There's no other way to put it when a defense has allowed an average of 47.25 points and 193 rushing yards per contest. Many criticized the Colts (myself included) for going for yet another offensive skill position piece with their first round pick last spring over fortifying their leaky rush defense. However, the notion that the Colts failed to address that weakness couldn't be further from the truth, as they added a pair of Stanford defensive linemen with their third and fifth round picks. Defensive end Henry Anderson and nose tackle David Parry came in with extensive experience in the Colts preferred 3-4 system, and the two of them have combined with veteran signing Kendall Langford to fuel an improved run defense that has held opponents to merely 3.8 yards per carry. Anderson has particularly stood out against the run, with his 17 solo tackles ranking fourth on the team, an impressive number for a defensive lineman. Both he and Langford have benefitted from Parry, who is undersized for a nose tackle but a bull who uses leverage well to anchor against double teams. Offseason additions to the linebacking group have also aided the Colts improved run defense. Former Bronco Nate Irving can be exposed at times in coverage, but is a physical downhill thumper against the run. He combines with tackling machine D'Qwell Jackson to form a rock solid duo against the run on early downs. Former Raider Sio Moore, a third round pick in 2013, is less of a thumper, but brings impressive sideline-to-sideline range and playmaking upside. He could be in line for a bigger role this week if Jerrell Freeman, the Colts best coverage linebacker, is unable to play through his groin injury (Freeman is listed as questionable). That role is certainly important, as the Patriots will continue to attack opposing linebackers in space with the ever shifty Dion Lewis. In a bizzarre turn from last season, this Colts defense could actually be more vulnerable against the pass than the run. The past few seasons have seen the secondary become the strength of the defense, thanks largely to the stellar play of cornerback Vontae Davis. However, this year they've ranked in the bottom third of the league in most major pass defense statistics, including yards per game (286.6, 5th highest), yards per completion (7.8, T-7th highest) and plays of 40+ yards allowed (4, T-9th highest). Is Davis healthy enough to be effective this week? When healthy, Davis is one of the few legitimate #1 corners in the league, but he was absolutely roasted by DeAndre Hopkins last week while playing through a foot injury. Davis has not been on the injury report this week, but it's worth keeping an eye on how he looks athletically early on, especially given that he could see his fair share of time shadowing the Gronk/Edelman duo for the Patriots. His ability in man coverage is absolutely key for the Colts secondary. 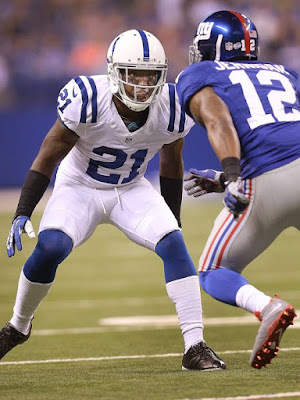 Even if Davis is fully healthy, the Colts depth behind him at corner is lacking. They got a boost last week from the return of starter Greg Toler, but the injury prone Toler has never been consistent enough to become the player his athleticism suggests he could be. The nickel corner is former Patriots second round bust Darius Butler, an eminently beatable corner who should be targeted early and often by Brady regardless of assignment, and replacement level journeymen Josh Thomas and Shaun Prater round up the depth chart. There should be no shortage of mismatches if the Patriots spread the Colts out and get some of those depth corners on the field. Things are a bit better at safety, where veteran Mike Adams has been solid and offseason addition Dwight Lowery has been a major upgrade over Sergio "tossed out of the club" Brown. Lowery actually enters Week 6 as PFF's eighth highest graded safety in the league. Despite this, neither of those safeties are ideal coverage matchups for Rob Gronkowski (honestly, does such a thing even exist? ), and Gronk can safely be expected to assert his physical dominance once again after a quiet (by his standards) game last week against Dallas. Their pass coverage has been poor, but the maligned secondary hasn't exactly gotten a lot of help from their pass rush. The Colts have a rotation of five edge rushers with legitimate NFL experience, including two (veterans Robert Mathis and Trent Cole) with Pro Bowls on their resumes. However, they've managed just six sacks in 5 games as a team, with both Mathis (age 34) and Cole (33) looking their age. Against all odds, it's been former Packers castoff Erik Walden whose led the rotation so far, leading the edge guys in tackles (10 solo) and tying Mathis with one sack. The pass rush could clearly use a spark, which could lead to more opportunities for second year man Jonathan Newsome. Last year's fifth round pick, Newsome has impressive speed off the edge and emerged as a solid pass rusher in sub packages late in the season, but he's been silent in a similar role this year. With Cole and Mathis both looking like they've lost a step, he's probably the Colts most explosive edge rushing option, with enough speed to be best option to test the slow-footed Marcus Cannon in his first game replacing Nate Solder in the starting lineup. The fifth guy in that rotation is former first round pick Bjoern Werner, who has been a bust when healthy and is questionable this week with a hamstring injury. While the Patriots have obviously had plenty of success running right at the Colts in the past, I wouldn't mess with the spread concepts that have worked for them all year. Instead, I'd expect the Pats to continue to spread the field with multiple receivers, forcing the Colts into playing a lot of nickel. The advantages to this approach are two-fold; not only will it create passing mismatches against the Colts overmatch depth corners, but it will also force the Colts to play with lighter personnel in the box, making them more susceptible to getting steamrolled once again on the ground. With Colts sure to load up against the run after the past embarrassing performances, the counter this week could be to reverse approaches and blitz them through the air. The Pats special teams have been very good once again in 2015, but they'll be facing off against an Indy team that's experienced similar success in the game's third phase. That success has started in the kicking game, where the ageless Adam Vinatieri and Pat McAfee are one of the few duos that rival the Pats combination of Stephen Gostkowski and Ryan Allen. Vinatieri has one uncharacteristic miss from the 20-29 yard range, but other than that has been as reliable as ever at age 43, while McAfee's booming leg has made him a field position weapon on both kickoffs and punts. He's only had one kickoff returned all year (for 5 yards), and it would be surprising to see either team return a kick with two strong-legged kickers teeing off in a dome. Strength will meet strength when the Colts punt to Danny Amendola. Amendola has consistently gotten the most out of his blocking, averaging an impressive 11 yards per punt return. However, the Colts have been downright stingy covering punts, allowing an average of just 3.3 yards per return on 10 returned punts so far. They've been less productive returning punts themselves, where Griff Whalen has failed to make any big plays as the primary return man. That's an area where they could look to put Dorsett's explosive open field ability to use, and his speed will make him a dangerous guy to avoid if the Colts put him out there more. With this being the first matchup between these two teams since last year's AFC Championship game, it's impossible for the pre-game hype to not focus on Deflategate and the Colts role in tipping off the overzealous league office. However, from the Colts perspective, the biggest story of this game is proving that they can step up and respond to the team that's punched them in the mouth in four straight contests. Win or lose, the Colts can't afford to be physically demoralized like they were in both meetings last year. From a Patriots perspective, there isn't a chance in hell that this is "just another game" to them, as they've predictably claimed throughout the week. There's been a lazer-sharp focus from this team (and Tom Brady in particular) from the get-go, and only the most naive fan would claim that doesn't at least partially stem from Deflategate and what the franchise and it's quarterback were put through this offseason. 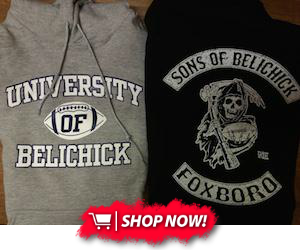 No one holds a grudge like Bill Belichick, who surely would like nothing more than to further humiliate the franchise that's done more to defeat the Patriots through the media and league office than on the field. Belichick and his staff already own a decisive coaching advantage over Chuck Pagano and an obvious talent advantage on paper. Combine that with the revenge factor, and it's tough to imagine them not trying to hang 70 points on the Colts, especially in their building. 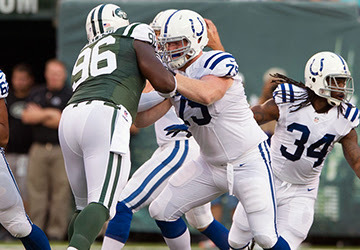 Make no mistake, despite their shaky start, the Colts have more than enough talent to make this a competitive contest. However, that's been true the past few meetings, and each one has turned into a bloodbath. Until they prove capable of better results, expect them to once again merely be a participant in the latest blowout of Tom Brady's revenge tour.